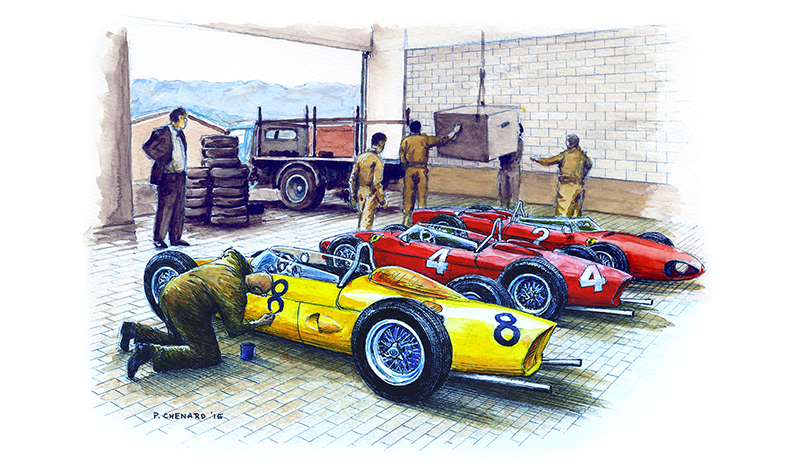 If you are a fan of straight-ahead race car illustration, you’ll love the motorsport art by Paul Chenard. 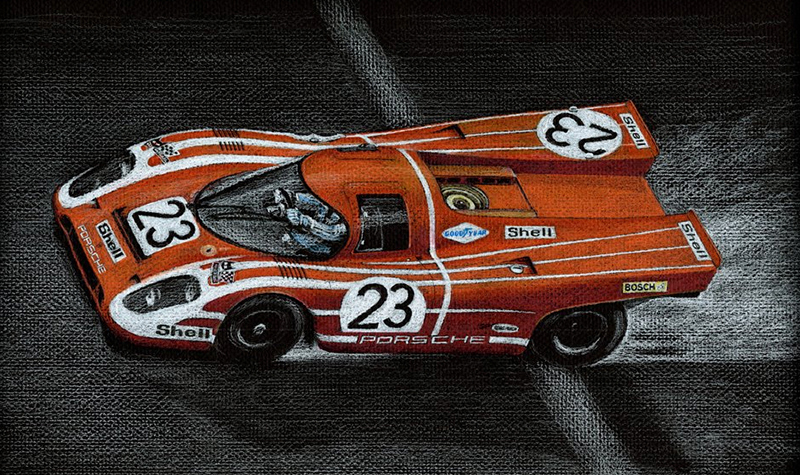 His art is highly accurate with a style that pops the images of race cars out of the background. I particularly like his treatment of cars in preparation for races because race mechanics are the backbone of the sport and recognized for their hard work only sparingly. I had the chance to meet Mr. Chenard at the 2018 Vintage Festival at Lime Rock. 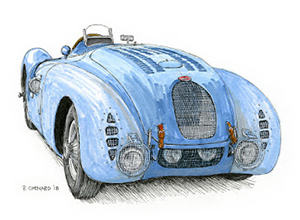 He was gracious in taking time to discuss his art with me while he was busy sketching the Bugatti 57G “Tank” that usually resides in the Simeone Museum in Philadelphia. 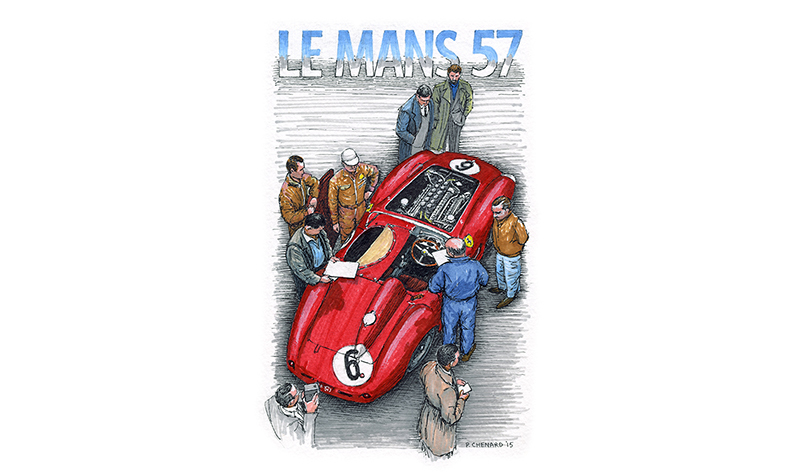 Chenard likes to tell a motorsport story in a relatively subtle but direct way. 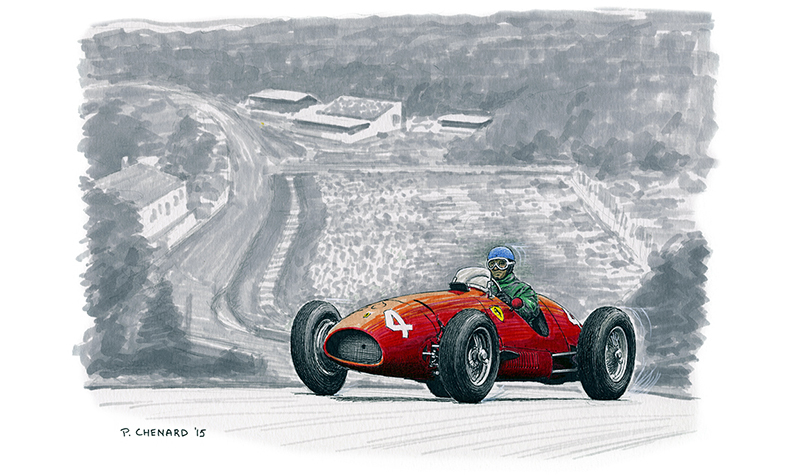 He tells the story of Spa in its original true road circuit state while depicting the great Alberto Ascari’s Ferrari. The car has just exited Eau Rouge, beginning to climb the steep hills of Spa. Ascari is about to work his way toward the dangerous straights and curves of the old circuit. You can see the old stands that reside in the pastoral setting that was the old circuit. There’s no sign of any official pits or buildings anywhere. Having done a track day there, it is fascinating to me to imagine where Ascari is headed. The current circuit is wonderfully fast but the old circuit was also very fast and wildly dangerous. At many places the road had homes at apexes of turns or were being used to define the edges of the circuit. If you have ever competed at any level of motorsport, you know how many hours are spent prepping the car for battle. 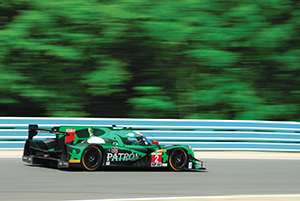 One loose nut or improperly fastened bodywork can spell disaster on the track. So to show high-level race cars being prepared in the “old days” when prep was often done in borrowed barns or sheds is especially fascinating. 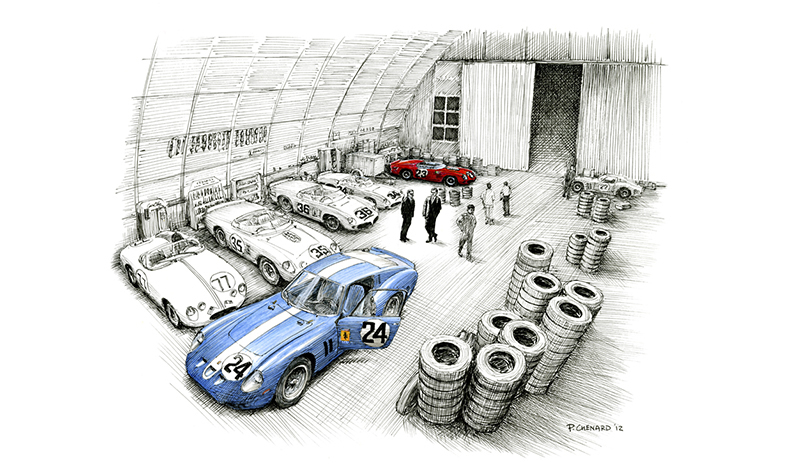 Ferraris and their spares are shown housed in one of the old aviation hangers at Sebring in the scene at right. Chenard pops the blue GTO in the foreground and the red Testarossa in the background. Compare this to the paddock enclosures of modern racing and you have to wonder how the mechanics were able to work in poorly lit and basic conditions. Check out the selection of artwork below and then go to Automobiliart to see even more. 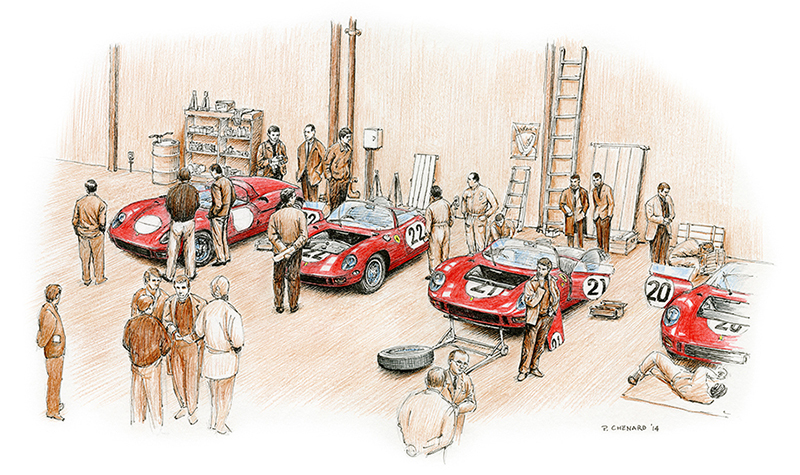 Chenard has also compiled some of his work in a book entitled Ferrari In Art, a celebration of the legend. A great book to have in your collection. 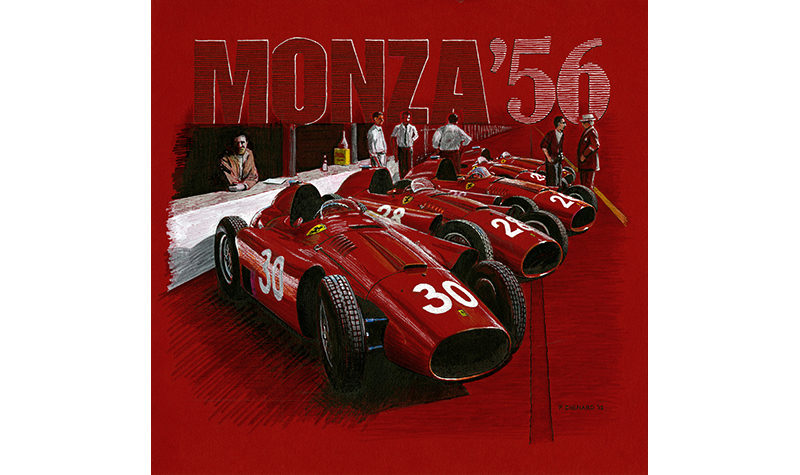 His artworks are available at Historic Car Art. 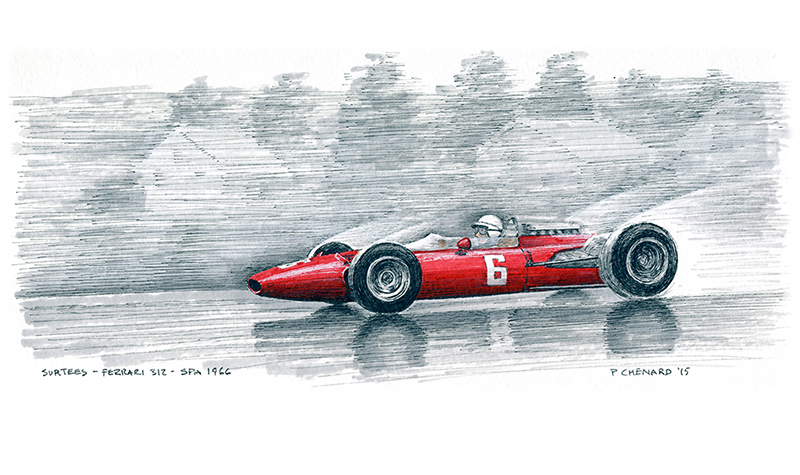 For more motorsport art, click here.